 Easter macarons: Edible art from Stay Sweet NYC. A number of pastry artists are creating colorful macarons for Easter, but we haven’t seen anything as lovely as these from Lindsay of Stay Sweet NYC. Her pastel cookies are decorated with abstract flowers. Lovely. But we’ve never seen dual-color ganache before! 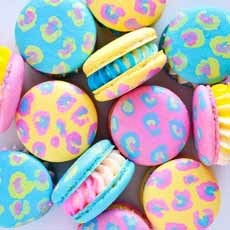 Who needs chocolate when you can give these macarons as Easter gifts to those who will appreciate them? Contact Lindsay for a quote for your custom order. 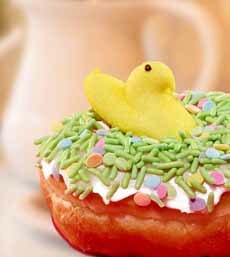 Dunkin’ Donuts’ seasonal PEEPS donuts arrive tomorrow at Dunkin’ Donuts nationwide. They’re accompanied by new PEEPS marshmallow-flavored hot and iced coffee and espresso drinks. Head to your nearest DD (here’s a store locator) for your PEEPS donut. It’s topped with white icing, a special green and egg-shaped sprinkle blend and a mini yellow PEEPS marshmallow chick on top. If you’re really into PEEPS, here’s how to make PEEPS cocktails. It’s pink with a marshmallow chick sitting on the rim of the glass. Make these PEEPS cupcakes with a hidden surprise. PEEPS mean that Easter is just around the corner (photo courtesy Dunkin’ Donuts). We have our favorite cheddar cheeses: artisan wonders like Beehive Cheddar from Utah, Cabot Clothbound Cheddar from Vermont, and Fiscalini Farmstead Cheddar from California. 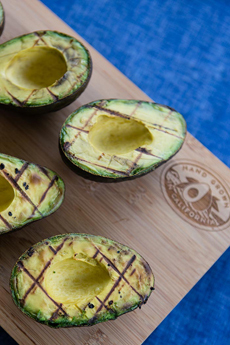 Our favorite “supermarket cheddar”—the 7- or 8-ounce prepacked bars found in supermarket refrigerator cases—is Cabot Cheddar, available in some 30 varieties including flavors we love, like Hot Jalapeño, Habanero, Horseradish and Tomato Basil. As we have lactose sensitivity, we enjoy a lot of cheddar, which is 100% lactose free (along with Jarlsberg). When we agreed to receive samples of Truly Grass-Fed Cheddar, we thought it was a domestic product. Turns out, it’s from Ireland. No wonder it tastes so special for a supermarket cheese. Cows that feed on lush pasture produce tastier milk. It’s that simple. (The milk is also more nutritious—more about that below). The milk for Truly Grass Fed cheddar comes from approximately 3,000 family farms located across Ireland. Our farmers share deep bonds with their herds, with sustainability and animal welfare always top of mind. Each farm has an average of one cow for every two acres of pasture, is Certified Animal Welfare Approved by A Greener World. AWA is an independent nonprofit farm-certification program, which guarantees that animals are raised outdoors on pasture on independent farms their entire lives, using truly sustainable, high welfare farming practices. And that’s why Truly Grass-Fed cheddars are creamy and delicious: made from the wholesome milk of cows living their best lives outside, grazing on plentiful green grass. The cows receive 95% of their nutritional feed from grass. They are grazed in fields for up to 300 days a year. What’s the big deal with grass-fed milk products? Studies show that the nutritional quality of milk is superior from cows that are grass fed, as nature intended them to be, versus those that are grain fed. 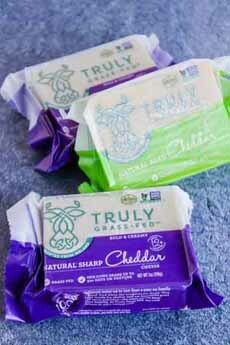 Different ages of Truly Grass-Fed Cheddar (photo courtesy The Sassy Dietitian, who has a recipe for corned beef, cabbage and cheddar baked potatoes. 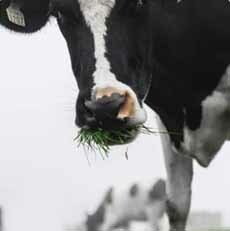 A diet of green grass, tastier for the cow, means tastier milk for us (photo courtesy Truly Grass Fed). 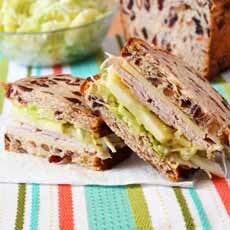 A turkey and cheddar sandwich on cranberry-walnut bread. Here’s the recipe from Beautiful Mess 46. 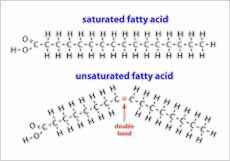 Conjugated Linoleic Acids (CLAS). CLA naturally occurs in milk; however, milk derived from grass-fed cows has twice the level compared to grain fed. Omega Fatty Acids. Grass-fed milk has a more optimal ratio of omega-6 to omega-3 fatty acids. Milk from grass-fed cows has a higher proportion of omega-3 fatty acids and a desired lower ratio of omega-6 to omega-3 fatty acids. Beta-Carotene. The powerful antioxidant beta carotene, which provides the rich golden hue†, is a benefit of dairy products made from grass-fed milk. Grass-fed cows eat (mostly) grass, their natural diet; while grain-fed cows eat (mostly) an unnatural diet based on corn and soy. If you were a cow, which would you prefer? *Silage is grass or other green fodder compacted and stored in airtight conditions, used as animal feed in the winter. It is typically stored in a silo; hence, silage. Hay is grass that is dried first. †Cheddars that are orange are colored with a natural vegetable dye, annatto. 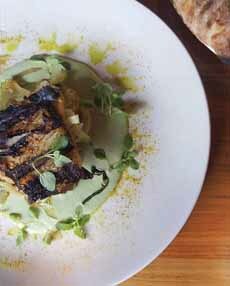 Multiple garnishes turn a piece of grilled fish into something special (photo courtesy Boutros Restaurant | Brooklyn). 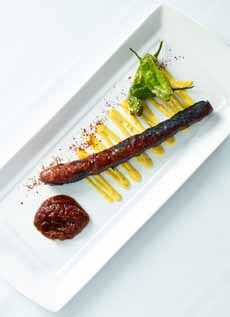 It can be as simple as this: an appetizer of merguez sausage and shishito peppers (shown), or steamed asparagus, or scallops, etc., accented with a zigzag of one condiment and dots of another (photo courtesy Pain D’Avignon). Underneath the garnish of zucchini curls, opal basil leaves and other herbs is a pork rib. 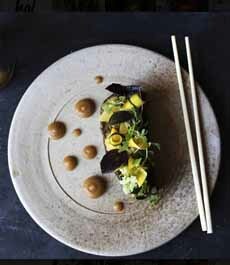 To the side, a garnish of honey mustard polka dots, made with squeeze bottles (photo courtesy Uchi Restaurant | Hai Hospitality). 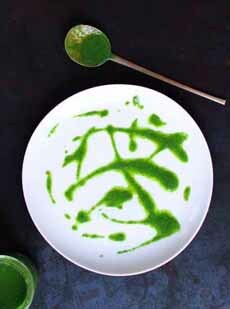 Using a spatter of basil olive oil combines both the sauce and the olive oil “layers.” (photo Botanica Magazine). Do you find that placing meat or fish on a plate with vegetables could use some oomph? We do. That’s why we’ve taken a page from the creative chefs’ cookbook and use multiple garnishes on the plate. 1. Sauce: Added a circle of sauce to the center of the plate. 2. Vegetables: Added the vegetables (or grains, mashed potatoes, etc.) on top of the sauce. 3. Protein: Added the protein on top of the vegetables. 4. 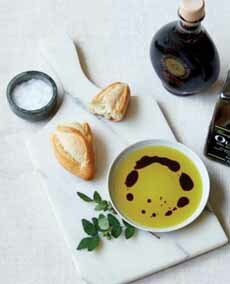 Olive oil: Added droplets of flavored olive oil around the sauce circle. 5. Spices: Sprinkled the plate with pinches of spice. 6. Herbs Or Greens: Topped with snipped herbs or microgreens. Or, if you are serving a salad, top the protein with the [lightly dressed] salad. This works best with soft greens (mesclun or components—arugula, baby kale, baby spinach, oak leaf or butter lettuce, watercress), which “drape” better over the protein. You can use harder salad vegetables (cabbage, carrot, fennel, onion, radish, romaine, etc. ), if they’re finely chopped/sliced. None of this is hard to do. The biggest decision—and time—is deciding what sauce to use. The sauce doesn’t have to be complicated; in fact, the easier, the better. Purée and season vegetables, from tomatoes to steaming whatever you have on hand (bell peppers, carrots, celery, peas, etc.). Thin or thicken as desired with broth, cream, mayonnaise, olive oil, sour cream or yogurt. You can also purée pasta sauce, add some sour cream or other dairy for a creamy sauce, or (if you prefer) serve it chunky. Canned soups are an old stand-by. Lightly dilute cream of asparagus, mushroom, tomato, etc. with a bit of milk or broth. This list is by no means exhaustive, and what you choose will of course complement the recipe. Look through your cabinets and fridge: You may be surprised at what you already own. (We found two jars of capers and one jar of caperberries!). 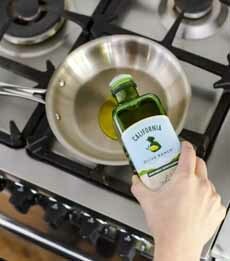 Look through your kitchen cabinets and decide how to garnish it. And as always, have fun with it.